Keeping the MBA relevant in an ever-changing economy and workplace has always been a central challenge for business schools. Founded in 1912, DePaul’s business college is one of the 10 oldest in the United States. This history reflects DePaul’s deep roots in the establishment of collegiate business education. 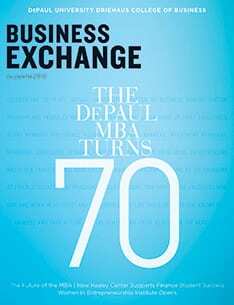 These roots extend to the DePaul MBA, as well, which is set to celebrate its 70th anniversary. While it might seem that the MBA has always been a part of the business school landscape, it is interesting to note that it was a rather innovative idea at the time DePaul launched its program. In fact, by the 1955–56 academic year, only 3,890 university-based MBAs were awarded in the entire United States. Today, the MBA is the gold standard of achievement in business education, with more than 100,000 degrees conferred annually. The evidence documenting the benefits of the degree is convincing. Decades of research by the Graduate Management Admission Council and the Association to Advance Collegiate Schools of Business demonstrate the value associated with the MBA, including the development of business knowledge and skills, expedited career advancement, enhanced professional networks and increased economic outcomes. These benefits directly derive from the scope of the training provided by the MBA, which spans business acumen and foundational business knowledge. It might be surprising to learn that despite the clear value of the degree, the MBA has been a continual target of criticism from both academics and business leaders in each decade since its inception. The earliest and most influential of these critiques were two commissioned studies published in 1959 by the Carnegie Foundation and the Ford Foundation. The reports lambasted business schools of the 1950s for their lack of focus on curriculum quality, low intellectual standards and overemphasis on vocational training. 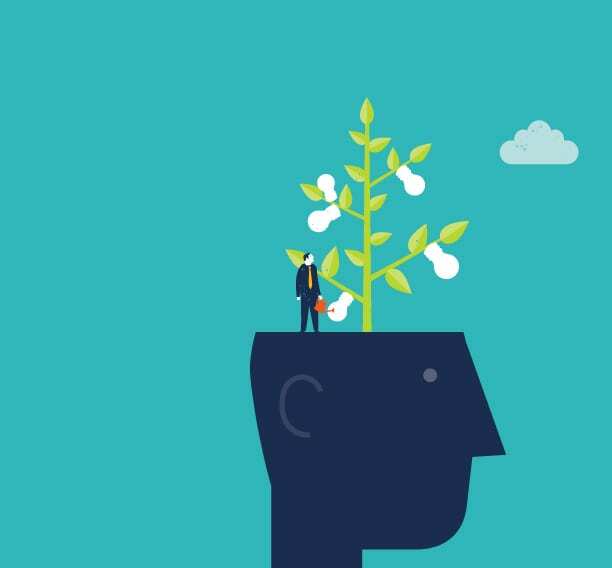 The report recommended the emergence of a new “managerial science” to provide a strong foundation for MBA education and a curriculum that would be steeped in the behavioral sciences, rather than intuition-based managerial practice. The reaction of business schools to the Ford and Carnegie reports was to create what has become the modern business school curriculum, with functional coursework in accounting, finance, operations, statistics, economics, marketing and management. To facilitate a managerial science approach, business schools began to hire faculty members with doctoral training who not only could teach in their subject areas, but also would transform the school into centers of research excellence. This blueprint took root in the 1960s and remains largely intact today. Beyond these early critiques and the resulting curriculum blueprint, the MBA has continued to be a focus of blame for faulty business practices and economic struggles. The degree has even been reviled, with headlines calling for the “End of Business Schools” and “Managers not MBAs,” and urging universities to “Bulldoze Business Schools.” Yet for all these criticisms, the truth is that the MBA has evolved continually to meet the unique demands and challenges of the business environment. Today, the MBA is the gold standard of achievement in business education, with more than 100,000 degrees conferred annually. In the late 1980s and 1990s, as the economy began shifting toward more knowledge-based work, the demand for conceptual and interpersonal skills related to service quality, business strategy and leadership began to emerge within MBA curricula. Similarly, events and changing business landscapes shortly after 2000 brought about an increased focus on ethics and globalization that resulted in remaking MBA programs to cover topics such as international business, supply chains and business ethics. Thus, while the “administrative” roots of the MBA have remained consistent throughout the years, the MBA always has been a malleable degree designed to equip business professionals for the contemporary challenges they will face. The challenges that face higher education are well documented and include shrinking college-age populations, increasing competitiveness in the educational market and the integration of learning technology. We see four additional and emerging challenges for business schools in particular. Addressing these challenges will be essential to ensure the relevance and ongoing benefits of the MBA. Bridging the “knowing-doing gap” in business education. Organizations are increasingly expecting graduates not only to possess business know-how, but also to immediately convert such knowledge into skilled performance to solve today’s complex business problems. Addressing this challenge means MBA programs must more effectively integrate experiential learning with more traditional lecture and case-based learning techniques. In addition, translating knowledge into proficient execution requires that students receive accurate skill-based feedback to promote self-awareness and development. At DePaul, we integrate substantial skill-based feedback through all stages of the MBA program and utilize external assessment and simulations to accelerate self-awareness and professional development. Preparing students for the impact of technology and automation on work. A 2017 McKinsey report forecasted that one-third of U.S. workers will need to transition to new occupations by 2030 due to automation of occupational tasks. These workforce changes are also predicted to increase employment demand for managerial roles across nearly every industry sector, as individuals will “spend more time on activities that machines are less capable of, such as managing people, applying expertise and communicating with others … requiring more social and emotional skills, and more advanced cognitive capabilities, such as logical reasoning and creativity.” Addressing this challenge means MBA programs must ensure not only that students have the conceptual skills to extract value from the output of machines, but also have a clear understanding of how such machine power may be misused or socially harmful. Addressing the growing demand for critical thinking and data analytics expertise. Here, another McKinsey report points to the striking talent gap for managers that are “big data savvy,” that is, those with basic knowledge of statistics who can pose the right questions for analysis, interpret and challenge the results, and apply these insights to decision-making. This challenge requires MBA programs not only to continue traditional coursework that teaches basic quantitative skills (e.g., statistics), but also to offer new training that builds the critical thinking skills needed to understand how to use data-driven insights strategically, as well as to recognize the strengths and weaknesses inherent in the data being collected and analyzed. Through new coursework in business analytics, and a new MS in Business Analytics degree, plus a greater emphasis on data science and digital transformation, DePaul is looking to equip graduate business students with these technical and critical-thinking skills. Balancing the need for specialization and generalized managerial competencies. The MBA is a degree intended to provide general managerial skills that apply across any business function, organization or industry. Today, many MBA students have less work experience, especially managerial experience, and come to the graduate program with only an undergraduate business degree. The shifts described above have created the need for more specialized expertise in many areas of business. Thus, business schools need to build longer-term commitments to students’ learning by creating stackable degree programs from specialized master’s degrees to doctorates in business administration, as well as short-term certificate and professional education programs to keep up with the pace of change. At DePaul, we’ve made investments in such educational programs and, in keeping with our mission, have increased access to our programs by partnering with professional associations and corporations to offer customized approaches to learning. The Driehaus College of Business has always evolved to meet the shifting demands of the workplace. Its faculty are nationally recognized as among the most prolific researchers of business education. From leading the integration of ethics into business education and using experiential and simulation-based learning to infusing multiple points of skill-based feedback for professional development and expanding degree offerings to include specialized master’s and doctoral degrees, DePaul remains at the forefront of graduate business education. 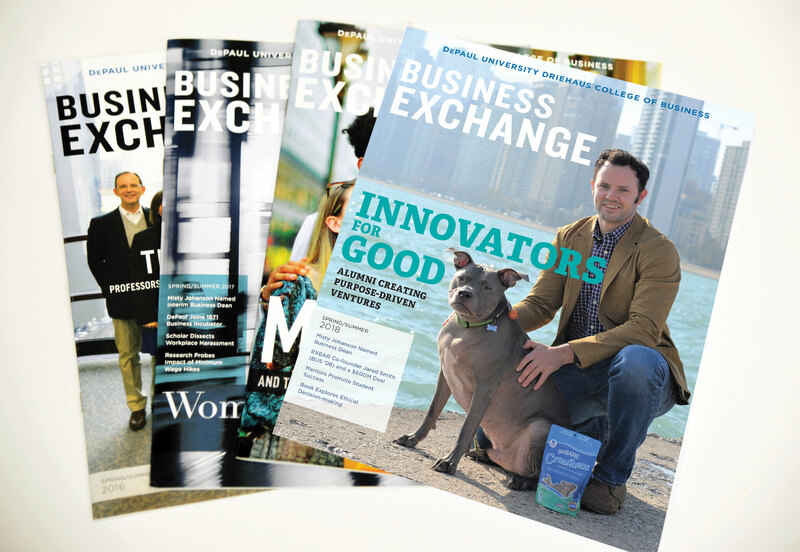 It is through changes such as these that we see a bright future for business education at DePaul and look forward to the 100th anniversary of the DePaul MBA and beyond. 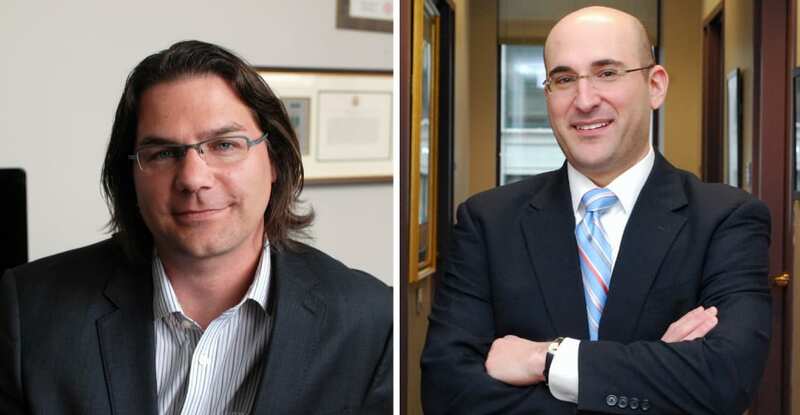 DePaul Professor of Management and Associate Dean of Graduate & Professional Education Robert Rubin (at right) and Professor of Management Erich Dierdorff (at left) are nationally known researchers and authors on graduate business education trends.